sometimes you forget to delete the Exchange 2010 CAS Array Object with “Remove-ClientAccessArray” within the Exchange 2010 Shell while migrating to Exchange 2013. 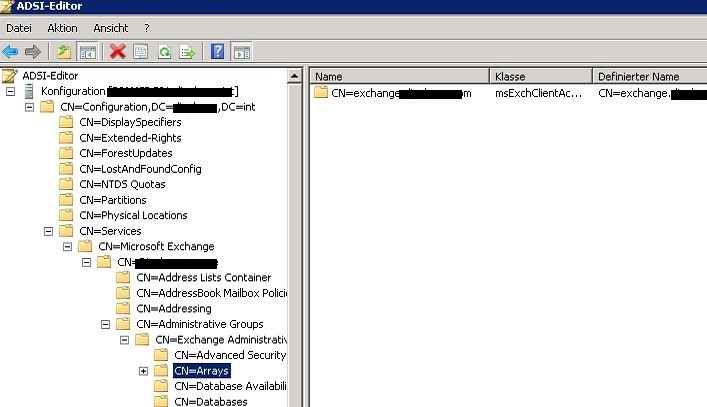 After Deinstallation of Exchange 2010 the “Remove-ClientAccessArray” isn’t available in the Exchange 2013 Shell. The following content originates from COMODO support forum. In all cases, a domain name, whether intended for internal or external use, containing a gTLD or ccTLD listed on IANA which is unregistered, or otherwise not controlled by the applicant will be rejected. This includes, but is not limited to the use of .INT as an internal domain name. The following are acceptable for internal use SSL certificates. Any other unreserved TLD domain names included on a certificate request will be reviewed on a case by case basis, but in all likelihood will be rejected. (a) As of July 1, 2012 (Effective Date), the use of Certificates containing Reserved IP Address or Internal Server Name has been deprecated by the CA / Browser Forum and the practice will be eliminated by October 2016. Also as of the Effective Date, Comodo WILL NOT issue a certificate with an Expiry Date later than 1 November 2015 with a subjectAlternativeName (SAN) extension or Subject commonName (CN) field containing a Reserved IP Address or Internal Server Name. Effective 1 October 2016, Comodo WILL REVOKE all unexpired Certificates whose subjectAlternativeName extension or Subject commonName field contains a Reserved IP Address or Internal Server Name. (b) If you are using an internal top level domain (TLD) which is not currently a valid TLD), such as those above, or others which we may allow at our discretion for your internal use in this certificate request, please be advised that should such TLD become recognized by IANA/ICANN as a valid TLD this certificate will be revoked without further notice. Prior to the certificate being reinstated you will need to demonstrate domain ownership/control.